Enzo Bianchi was born in Castel Boglione (AT), Monferrato, on 3 March 1943. After his studies in economics at the University of Turin, in 1965 he moved to Bose, a small village outside the town of Magnano, on the moraine ridge between Ivrea and Biella, where he thought to start a monastic community. In 1968 br. Enzo was joined by the first brothers and sisters and during this time he wrote the community rule. He is still the prior of the community, which numbers about eighty members, men and women coming from five different countries. The community is also present in Jerusalem (Israel), Ostuni (Apulia, Italy), Assisi (Perugia, Italy), Cellole-San Gimignano (Siena, Italy), and Civitella San Paolo (Rome, Italy). He was prior of the community from its founding to 25 January 2017. 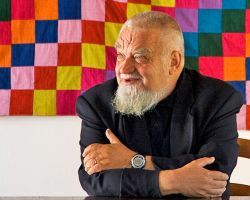 In 1983 he started the community publishing house Edizioni Qiqajon, which publishes texts on biblical, patristic, and monastic spirituality. In 2000 he was granted a honoris causa degree in Church history by the University of Turin. As a member of the executive board of the Catholic committe for the cultural cooperation of the Pontifical council for promoting Christian unity, in August 2003 he was one of the members of the official delegation requested by pope John Paul II to return the icon of the Mother of God of Kazan to the patriarch of Moscow, Alexis II. As a special expert appointed by pope Benedict XVI, in October 2008 he attended the synod of the Roman Catholic bishops on the theme of the Word of God and in October 2012 he attended the synod of the Roman Catholic bishops on the New evangelization for the transmission of the Christian faith. In 2014 pope Francis appointed him consultor of the Pontifical council for promoting Christian unity. In the same year he was made honorary citizen of Val d’Aosta and of Nizza Monferrato, in 2017 he was made honorary citizen of Palermo. Member of the executive board of the Catholic committee for the cultural cooperation of the Pontifical council for promoting Christian unity. He is also a collaborator and advisor for the radio broadcasts Uomini e profeti (Rai Radiotre) and Ascolta si fa sera (Rai Radiouno). In 2007 he was granted the prize "Grinzane Terra d'Otranto", in 2009 the prize "Cesare Pavese" and the prize "Cesare Angelini" for the book Il pane di ieri. In 2013 he was awarded the international prize for peace and in 2014 the Artusi prize.